Perhaps the most fundamental characteristic of living organisms is their ability to reproduce. In unicellular organisms, copying the genetic information and organelles (if present) occurs and the cell divides, creating two self-sustaining cells virtually identical to each other. In multicellular organisms, cell division serves two main functions. First, cell division gives us new cells so that our bodies can grow and develop. Second, cell division allows us to renew old, worn out cells or to repair cells that are damaged. In sexual organisms, the genetic information must be halved into gametes before recombining to form zygotes. This process is known as meiosis. Binary fission literally translates to splitting in half, and that is how all prokaryotes reproduce. Compared to eukaryotes, this process is simple. The chromosomes of bacteria replicate. The cell grows, pinches and eventually divides. This form of replication is asexual, resulting in two exact clones. Genetic variation only occurs from mutations that occur during a prokaryote's life cycle. The life cycle of a eukaryotic cell has three main phases. Most of its life is spent in Interphase, where the cell grows and a copy of the chromosomes are synthesized. In mitosis, the nucleus (and the chromosomes) divide. Once the nucleus divides, the cell continues to grow and divides in a process known as cytokinesis. Interphase is the process of the cell cycle in which the cell carries out its ordinary functions, and is when the chromosomes replicate. Interphase can clearly be seen in eukaryotic cells, because the chromosomes relax, becoming barely visible with a compound microscope. In contrast, chromosomes in mitosis are condensed and clearly visible. 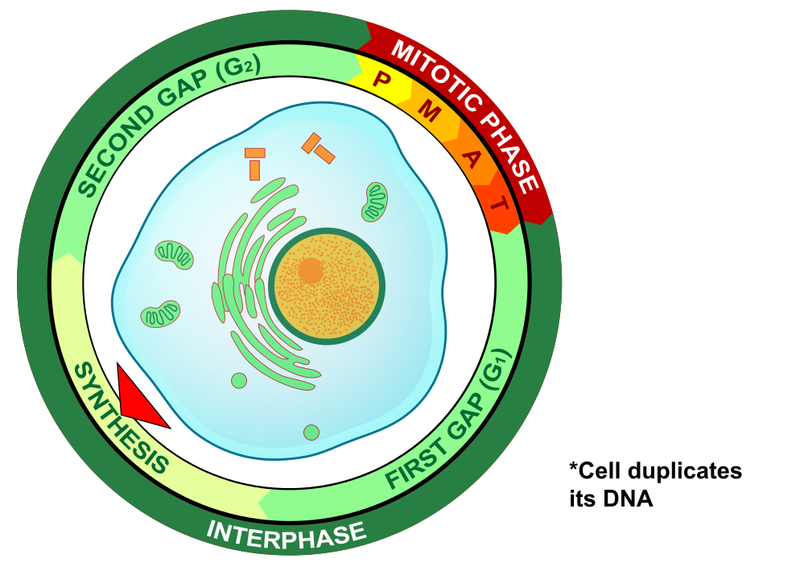 Cells all begin interphase in the G1 phase, which stands for Gap 1 referring to the gap between the division of the cells and when the chromosomes divide. Continuing to grow and carry out normal functions, eukaryotic cells replicate their chromosomes during the S phase of Interphase. S stands for synthesis (of a new set of chromosomes). These matching sets of chromosomes are known as sister chromatids. The G2 phase begins when the chromosomes have been duplicated, but before the chromosomes condense. Once the chromosomes condense, the cell enters into mitosis. While the chromosomes are replicated during the S phase of Interphase, the replicated chromosomes are separated during mitosis generating two nuclei with exact copies of chromosomes. In the transition from interphase to mitosis, the DNA molecule begins to condense around histone proteins, coiling up on itself, creating a dense collection of DNA and proteins visible in a compound microscope. Once the chromosomes have condensed, spindle fibers grow from centriole pairs, attaching to the centromere region at a protein structure known as the kinetochore. Once the spindle fibers attach at the kinetochores, the centriole pairs ratchet the spindle fibers in opposite directions, separating the chromosomes. Mitosis begins with prophase and is identifiable by the complete condensation of the chromosomes. When this occurs, chromosomes are visible under the microscope. During prophase there are two exact copies of sister chromatids in each homologous chromosome. Also during prophase the centriole pairs begin to migrate to the poles and spindle fibers emerge from the centriole pairs. Furthermore, the nuclear envelope begins to disintegrate. Prometaphase is a continuation of prophase. The nuclear envelop continues to disintegrate until it is completely nonexistent. The spindle fibers continue to grow from the centriole pairs and connect to the kinetochore of the centromere region of the chromosome. The centriole pairs continue to move toward opposite poles. Once the spindle fibers attach to the kinetochores at the centromere region of the homologous chromosomes, the centrioles begin to push the homologous chromosomes towards the center of the cell. The chromosomes align along the metaphase plate. Once the chromosomes align at the metaphase plate, the centriole pairs begin to constrict the spindle fibers (much like a fishing reel), separating the homologous chromosomes. Once separated, these structures are called daughter chromosomes. Daughter chromosomes are identical copies of each other. During telophase, the spindle fibers disappear. 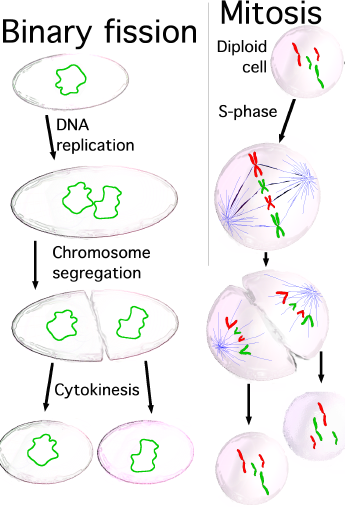 Once the daughter chromosomes arrive at the poles, a nuclear envelope reappears around each set of chromosomes. At the end of telophase, there are two nuclei in one cell, known as daughter nuclei, each containing an exact copy of chromosomes. 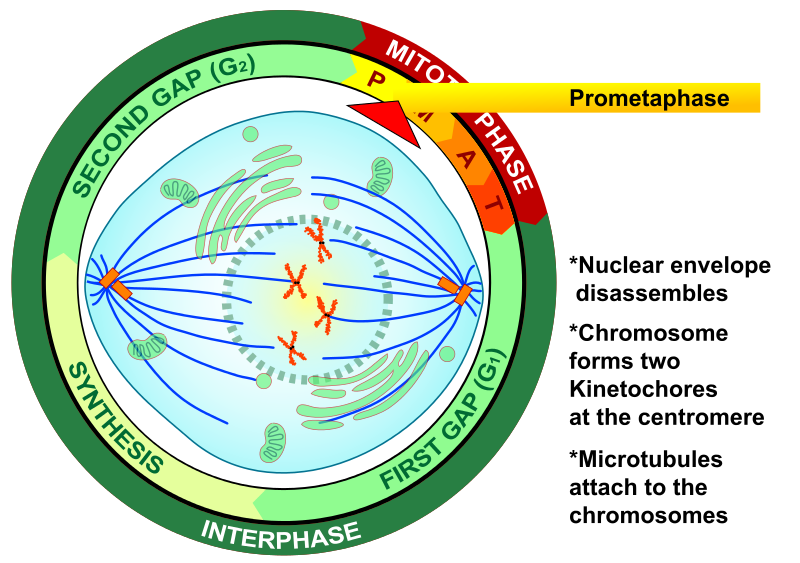 After the nuclear envelope reemerges, the chromosomes relax and the remainder of the cytoplasm undergoes division in a process known as cytokinesis. In animal cells, the cleavage furrow emerges because a row of actin filaments emerge just inside the cell membrane, constricting the cell membrane in on itself. In plants, vesicles secreted from the Golgi apparatus fuse in the equator of the cell forming the cell plate. This structure adds cell wall material between the two daughter cells. This plate continues to grow until it comes in contact with the existing cell membrane of the daughter cell in which it merges, and the cells separate.